For Bera Bera, reaching the Women’s EHF Cup Phase was already a goal fulfilled, yet they did not hide the desire to create some surprises. Both rivals started the Group Phase with victories, so the winner of their clash in Germany would top Group B for the next week. And the two points went to the ambitious Siófok, who made an important step towards the quarter-final. A week before, the Croatian left back Andrea Kobetic had had a great impact in the opening game against Herning-Ikast, finishing with 11 goals. At Metzingen, the 33-year-old did an even better job, scoring 13 times and contributing significantly to her team’s win. However earlier in the game, Kobetic was outshadowed by her teammate Estelle Nze Minko. By the time Siófok led 9:7 midway through the first half, the European champion from France had already scored six goals. The Hungarian team had a four-goal advantage at the break, and went on to dominate in the second half despite losing Simone Bohme, who netted six times before getting a red card. Metzingen’s effort to stay in the game was in vain. Led by the unstoppable Kobetic, Siófok did not relax and went on to clinch their second victory in a row. After starting the Group Phase with a win at Larvik, Viborg went on to celebrate another victory, this time at home against Besancon. The Danish side are currently top of Group C with four points, while their French rivals are yet to claim their first points in the competition. “Right now everything looks good, and we have created a good distance to Besancon, but we’ll have two matches against Kuban. If we end up with no points in them, we will not be safe. So it is very important for us to win every home game. If we succeed in it, I am pretty sure we will qualify for the next round,” said Viborg’s coach Jakob Verstergaard. His team had the upper hand from the opening minutes, taking a 3:0 lead. Besancon did poorly in attack, scoring just twice before the 10th minute, and although they improved later on, the five-goal advantage gave the Danish team a comfortable feeling at the break. In the second half, Viborg marched on and did not allow the visitors to come close. 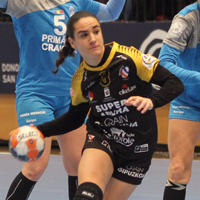 Amalie Groen Hansen finished the game as the home team’s best scorer with seven goals, while no Besancon player could net more than four times – even if 11 of them put their names on the scoresheet. “I think we made a lot of mistakes, and against this type of team, mistakes are punished. We are a young team and don’t have a lot of experience, and this evening the difference between the two teams was too big,” said Besancon’s coach Raphaelle Tervelle. Earlier in the current EHF Cup season, title holders Craiova had shown an extremely solid defence, which allowed them to beat Borussia Dortmund in Qualification Round 3 (19:17, 19:18) and Nykøbing in the opening game of the Group Phase (18:12). But Bera Bera found the key to Craiova’s goal. In the first half alone, the Spanish side scored 18 goals, and went on to claim a 32:21 victory, grabbing their first points ever in the EHF Cup Group Phase. Craiova had a better start to the game, at one point having a three-goal lead. Yet Bera Bera drew level, and they did not concede a goal between the 16th and the 27th minutes, building up a 16:9 advantage and turning it into 18:10 at half-time. Renata de Arruda did a great job in goal for the home side, while Silvia Arderius shone in attack, scoring seven goals. Craiova looked totally desperate and chaotic, made too many mistakes and ultimately conceded the largest number of goals (32) in their European history.